The definite adoption of the 9 mm calibre " para. bellum " for the automatic pistols issued to the Armed Forces and Police detachments during the last war, was not only caused by the necessity to unify the calibres of pistols and light machine guns (especially Sten gun type), of ever increasing diffusion with the Armed Forces of the various countries, but also by the excellent ballistic characteristics of this calibre. The difficulties in supply and adequate training as well as the serious inconveniencies produced in the logistical sector of operating units, and caused by the existing differences in calibre of the small arms, are well known. This need for the unification of the small arms calibres was felt most strongly by the Navy and Air-Craft Forces it their special detachments often engaged in isolated raids, landing operations, command actions, police service, etc. And the considerable supply difficulties aggravated by the special displacements of these units (such as bridgeheads, ports, observation points, airports, etc.) made it necessary to reduce the types of ammunition to be issued to each group to the absolute minimum. To satisfy above-mentioned requirements the " Pietro Beretta " Weapon Factory decided to study and to realise a " 9 mm. long " calibre automate pistol, answering to the above characteristics, and which does represent not only the experiences gained by its staff in the manufacture of over 2 million pistols, but also the results of the studies and experiences of the best foreign industries. This pistol uses as locking device a vertically sliding, catch, the recharging system is based upon the recoil of the barrel; both operations have already been proved with excellent results by the construction technique here and in the best foreign industries. The system presents, in addition, and compared with that based upon fixed barrel and single gas utilisation, with equal cartridge and weight, the considerable advantage of a sensible reduction of the recoil speed with the consequent reduction in the jumping of the weapon during the firing. Outstanding are the excellent results obtained through the use of the light alloy "Ergal" in the manufacture of the body, which made possible the reduction of the weight of the 9 mm long to an only 0,720 kg. (25.4 ozs), using at the same time the ammunition of the light machine gun which is considerable more powerful than the normal 9 mm. long ammunition as used before the war. The weapon, despite its reduced weight, has been especially studied for this ammunition which develops a maximum pressure of 2100 kg/cm' (29,862 Ibs/sq.in.). The cartridge, weighing 7,45 g. (0.25 ozs), possesses an initial speed of 340 m/sec (1164 ft/sec) with a considerable stopping power up to 150-200 m. (500-650 ft). The 9 mm. 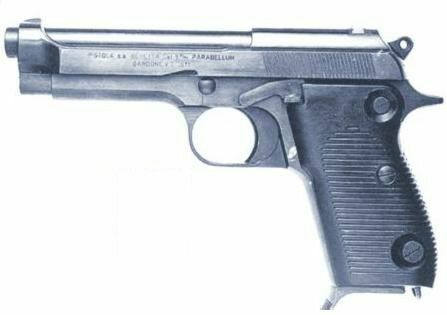 short pistol, which forms part of standard equipment of the Italian Army, weighs 0,710 kg. (25.1 ozs), its cartridge, of 6 g. weight (0.21 ozs), develops a pressure off 1200 kg/CM2 (17,064 lbs/sq. in.) with an initial speed of 280 m/sec (920 ft/sec). Thus the 9 mm. long, though only very slightly heavier, possesses by far superior ballistic characteristics.The experiences of the recent Corean war proved that an individual defence weapon of high ballistic qualities is still required, the more so against the dangers of enemy raids and partisan warfare met with during the supply and contact service, and which demands a ready reaction based upon efficient weapons of outstanding offensive power. Modern warfare, in fact, created the phenomena of guerrilla warfare which takes place at the flanks, of the operational army units, and the use of pistols and light machine guns, despite the development of new weapons possessing a very high destructive power, cannot yet be considered as obsolete even in modern theatres of war. PLEASE NOTE: The M-951 was the first ever .9mm pistol to enter in service between the Italian Armed Forces and Law Enforcement Agencies; this happene d in the 1970s, and the M951 replaced the venerable .32-ACP BERETTA 38, which were dated back at the years of WW-2 and subsequently were now obsolete. However, the M-951 also was produced under license in Egypt and Iraq; Iraqi Armed Forces and Law Enforcement still retain it in service, while Egypt has longtime replaced it with a national-made, licensed copy of the BERETTA M92-FS. The BERETTA M951 was also adopted as the standard sidearm for the Israeli Defence Forces, which replaced it with the currently issued IMI JERICHO back in 1980s. Up to the Italian Armed Forces, they replaced the M951 with the currently issued BERETTA M92-FS back in the end of 1980s, while the Italian State Police and Carabinieri had the M92-FS issued in 1992.